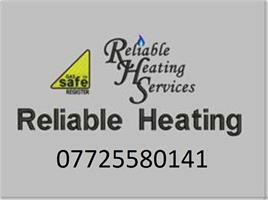 Reliable Heating Services Ltd - Central Heating Engineer, Plumber based in London, Greater London. Family run business based and working in London & surrounding areas. We undertake both big and small jobs ensuring our customers safety as top priority as well as making sure that they are more then happy with the finished product ! I previously worked for British Gas and a number of Local authorities within plumbing and heating so I hold many years experience within the gas industry. We specialise in diagnosing boiler issues along with general servicing, repairs and installations. We also offer landlords/letting agents Gas safety inspections (CP12's). Our company take great care of our customers and are ALWAYS on hand to answer our customers questions and give any advice that they seek. We have built up a strong & loyal customer base & pride ourselves with giving them 100% at all times.